The Skylink ATC tower completed in 2006 is 109m tall. 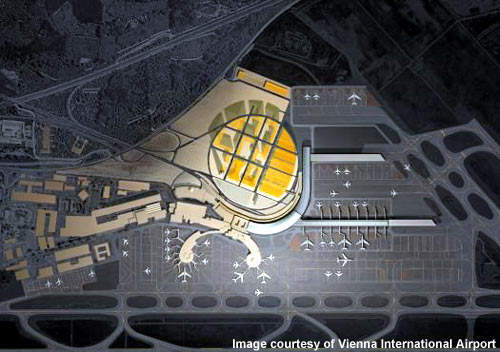 A plan view of Skylink at Vienna International Airport. The new Skylink terminal extension departures drop-off area. Skylink check-in at Vienna International Airport. The Skylink construction site in 2006. 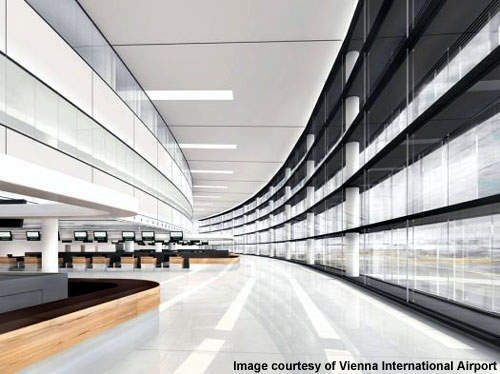 Skylink will increase Vienna International Airport's capacity to 24 million passengers a year. Construction has continued while the airport is still in operation. 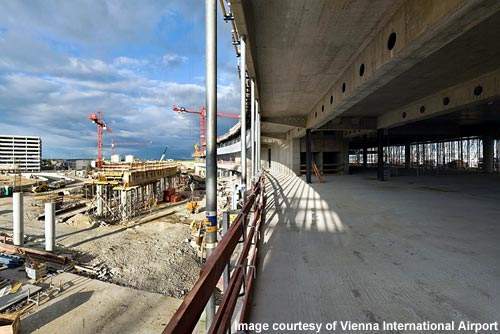 Vienna International's new pier will have 51 gates. Skylink will have a distinctive curved shape. 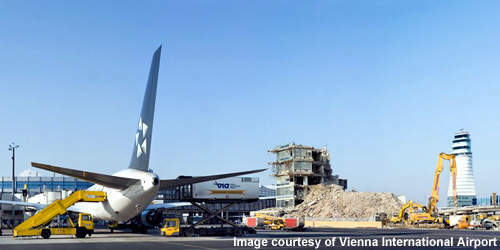 Vienna International Airport is the biggest and busiest airport in Austria. 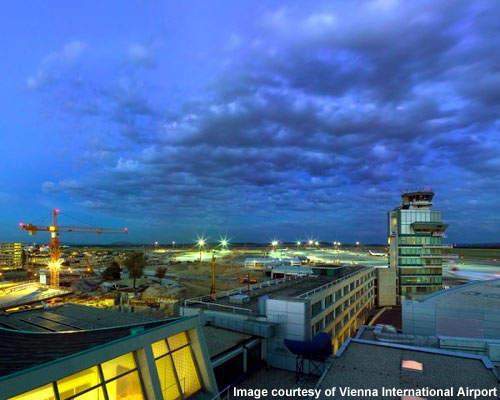 The airport, first built in 1938 as a military installation, is actually situated around 18km from the City of Vienna near the town of Schwechat and the airport is sometimes called Schwechat Airport. The airport has two runways and a main terminal building with three smaller attached satellite terminals. With passenger and cargo traffic increasing for the airport in 2000 the 2015 masterplan was designed to shape the future of the airport. Part of this was the new Skylink project which will give the airport a passenger capacity of 24 million passengers a year (projections expect to see 20 million passengers a year by 2010). The project is aiming to increase the available terminal space and to bring the airport into a more efficient configuration to handle larger aircraft and to comply with international regulations about the separation of Schengen and non-Schengen operations at the airport. 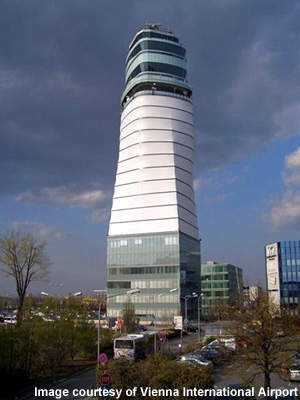 A new 109m-high Air Traffic Control tower (ATC) was completed in 2006 on a site adjacent to the World Trade Centre. The tower also holds night-time laser shows for the entertainment of passengers. The new Skylink terminal which started construction in 2006 and is expected to be completed by the third quarter of 2008. The master plan also allows for this to be expanded again before 2015 if passenger volumes dictate. The third runway will begin construction in 2009. 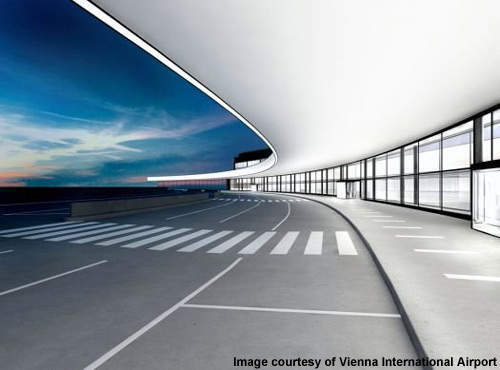 The underground railway station will be expanded and a new underground station will be constructed for the City Airport Train to the centre of Vienna. In November 2000 the architects Itten-Brechbühl / Baumschlager-Eberle undertook the first (preliminary) phase of planning, which led to the submission of the plans to the authorities. Approval for the construction of Skylink was granted in November 2003. Following the successful planning application a new architect, the P.ARC-Moser-Neumann consortium, was awarded the contract for the further planning of the project. Skylink is a terminal expansion project that will join on to the existing terminal two. The new 150,000ft² structure will curve off in a distinctive sickle-shape towards the north-east. The newly constructed 51-gate south pier will now provide a total of 17 additional aircraft docking positions (can be widebodied jets). A subsequent phase of construction will see the construction of an additional North Pier. The development will also include the ‘north-east apron extension’ between and to the north of the two fingers of the pier and will involve construction over a railway line. The Skylink extension will help to promote an under-one-roof concept (airport city) for the airport integrating the existing terminal buildings with the new pier and also giving covered access to the multi-storey car parks and railway stations. The 730m curved terminal building has been designed with glass façades on its north and south aspects, which will give an important visual connection for passengers between the landside and airside of the airport. The main hall of the terminal extension has been designed to be airy and spacious in an open plan concept making full use of natural light and allowing ‘connections’ to be made at all levels of the building. The roof of the terminal has been designed to be a signature element of the airport arching over the entire terminal area. The extensive use of glass in the building allows excellent views from all areas of the airport of the surrounding countryside which is aesthetically pleasing and also functional, allowing passengers to see exactly where they need to be as soon as they have cleared check-in and security. The Skylink extension will also add significantly to the airport’s check-in facilities, retail areas, food and beverage offerings and lounges. The €60m ($71.9m) contract for the Skylink expansion was awarded to Hochtief Construction AG in October 2005. The contract includes construction of Skylink and partial fitting out. The contract has also included Hochtief’s Austrian subsidiary Dipl. Ing. Hugo Durst GmbH. Another Hochtief subsidiary, Streif Baulogistik GmbH, has also won a €1.9m contract for the construction and operation of a 500-unit container village at the airport.